What are the barriers to productivity for mobile workers, and can they be overcome? Mark Geremia, Vice President and General Manager for Dragon Professional and Consumer, Nuance Communications, thinks a speech-based solution addresses many frustrations. It is interesting to observe the changes that have happened to how and where we work. Some of them – like working from home – have been driven by factors ranging from offices decentralising to companies encouraging the practice to reduce the impact of commuting, to working from cafes to train stations; a flexibility that has been facilitated as much by the proliferation of more portable mobile devices as it has been by better Wi-Fi availability across the country. One aspect of the workplace revolution that has been slow to catch up with the needs of remote workers, is, arguably, that of document creation and sharing. While applications like those found in Microsoft Office are easy enough to use on a laptop, the move toward smaller-form devices like tablets and smartphones is making popular business applications trickier to use. And, as we’re aware, complexity can hinder productivity, which is a concern for all businesses operating in a demanding global economy where the efficiency of employees can have a tangible impact on profitability. Thanks to technology, there is cause for celebration, though. While Artificial Intelligence (AI) and speech recognition have become the tech buzz words in 2017, they have also driven a solution to the challenge of using business applications on mobile devices when away from the office. Speech recognition in particular has much to commend it from a business perspective; given that we talk up to three times faster than we type, it meets the requirement for driving productivity. Furthermore, on-going research and development have resulted in accuracy levels that, today, are nothing short of outstanding, even if users have a pronounced, region-specific, accent. You only have to look at the progress made in the field of desktop speech recognition to witness the benefits it can deliver. While speech has made admiral progress, until recently, the challenge has been how to apply the benefits of speech recognition in conjunction with the devices people use today and the business applications they depend on. Of course, people could always dictate notes on a digital voice recorder and have them transcribed – either by using speech recognition or going to the expense of outsourcing it - but doing so introduces delay as well as costs to the process. Although some speech-based applications for mobile devices are available, none have combined the technology with what business users really need - a professional-grade feature set that makes it easy to not just interact with, say, Microsoft Office applications, but to have full editing capabilities, to enable users to create professional-looking documents just as they would if they were at a desktop PC. Furthermore, what they have also lacked is the seamless integration and flexibility to prepare or part complete a document on a mobile device and then sync it effortlessly with their desktop PC – or vice versa – giving them full control over their document, irrespective of the device they are using. Those are barriers that have impeded the productivity of some mobile workers, frustrating them, the companies they work for, or the clients they are responsible to. To address this, Nuance Communications – the developer of the Dragon family of speech recognition solutions for the desktop and mobile devices – created Dragon Anywhere. As its names implies, Dragon Anywhere is a cloud-based mobile application for iOS and Android devices. It brings Dragon’s powerful voice dictation and documentation productivity capabilities to mobile devices. Designed with the growing mobile workforce in mind, Dragon Anywhere enables users to create and edit complete reports and documents and capture detailed notes while on the go. The benefit it delivers is that it empowers field workers, lawyers, social workers, insurance adjusters, public safety officers, and other professionals to keep up with documentation demands, even when they are away from their desks. You can imagine a scenario where it can help busy professionals; they can finish a meeting, a site visit, an inspection, or other work in the field and begin documenting the interaction on their mobile device—while the information is still fresh in their mind – to produce more accurate and detailed reports. And, because dictation is captured immediately, they can review and correct on the spot, without having to transcribe a recording later or pay for costly transcription services, which often take days to come back. Furthermore, Dragon Anywhere creates a powerful cross-device experience, enabling Dragon users to quickly and easily access documents saved to a preferred cloud service from their desktop. Customised vocabularies and auto-texts are also shared across an entire Dragon experience with Dragon Anywhere’s ability to sync with Dragon Professional Individual and Dragon for Mac. Someone already enjoying the effectiveness of the solution, is Graeme Blenkinsopp, the managing director and managing partner of Wisemove Land and Property Consultants. The company excels at sourcing land for self-build and sales to major house builders. With a focus on customer service, combined with its ability to spot promising land opportunities, the company enjoys continued success. While that addresses the company’s office-based needs, Graeme has a specific field-related requirement. “We’ve spent a long time searching for a mobile equivalent to desktop speech recognition that gave us the same functionality as Dragon. Apple’s own speech recognition system, Siri, is useful, but it not really designed for the applications we had in mind, nor the sheer volume of text we needed to capture when we’re out and about,” Graeme explained. While progress is inevitable, it’s rarely uniform. 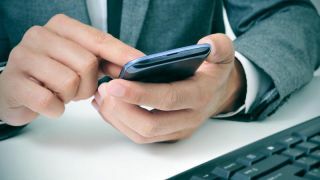 Now, mobile workers finally have access to a productivity-boosting app that bridges the gap between what they can do on their desktop PC and laptop and what they can do on their mobile device. And that has to be good news for them, the clients they serve, and the bottom line of the business they work for, too.